Overall, Democrats gained enough seats to take control of the House, but the remaining House Republicans include more Far Right politicians than ever before, in the history of the country. Outgoing Republicans were overwhelmingly moderate “Conservatives” and “Center Right” leaders. Many of these people retired rather than face a tough challenge. If history is a guide, most of the newly elected Democrats will be the first voted out in 6-10 years, if Republicans take back the House. This should be intuitive: they ran in the few remaining competitive districts whether neither party has a built-in 20 point advantage. More Far Left candidates won in 2018 than would be expected, in part because of Trump’s inspiring (against him) rhetoric, and in part because there are safe districts where these candidates can operate, just like those safe Far Right friendly districts. There are no (zero) moderate Republicans in the house, based on the xkcd voting record definition. And therefore, it is very unlikely that compromise legislation will pass with Republican votes. Non bi-partisan legislation that passes entirely with Democratic votes is more likely to be a compromise bill and better reflect the makeup of the general population’s views than bills that have Republican votes now. The makeup of the Democratic party in the House covers most of the historical political spectrum, including the perspective of ousted moderate Republicans. Democrats operating from “Red States” now represent some of those views. Few Americans are naturally Far Left or Far Right in their views. 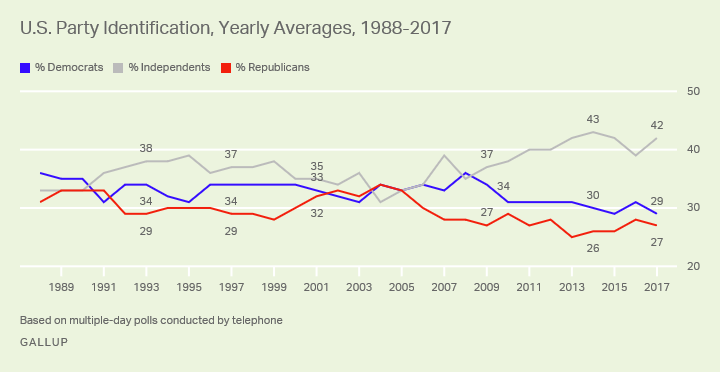 About 42% of Americans self-identify as independents, according to a recent Gallup poll. And although that’s been stable over decades, it has risen in the past ten years. Most people are center-left, center-right, or apolitical in their views. This doesn’t mean they never vote, but more that they struggle to find candidates that align with their values and their identity. They’re unstable and unreliable voters. And of course many don’t vote that often, because it is hard to vote if the options are “bad” or “misaligned” with your own identity. Given that compromise legislation is unlikely, policy is irrelevant. Laws are not going to change much in the next two years. Instead, Democrats should start talking about their identity and their values, if they want to win in 2020. Identity already defines how and why people vote. But instead of allowing identity to destroy any ability for political compromises, we should use identity to heal and transform people – who have for too long been listening to messages that stoke their egos and bestow them with a greater sense of importance. Racists are racists because those beliefs restore their own sense of dignity. Understanding that is the point of my podcast, and the purpose of episode 51: Transformation.